There is Cake! - Fact or Myth? What makes something “Kafkaesque”? – Noah Tavlin. The search for cake (AKA meaning) in life can be rather Kafkaesque. When people say Kafkaesque they mean, loosely: “a bureaucratic, confusing, and nightmarish grind toward an unclear and almost certainly unattainable goal, and then pushing on with maddening fervor toward that goal despite the absurdity of the situation.” In other words, the maddening journey of looking for essentialist meaning, in a “bad faith” attempt to make the meaningless meaningful, in an existential world. So the Cake in Portal, and the Kafka’s works in general (including my personal favorite the Castle), are loose metaphors for searching for meaning in something meaningless and being motivated toward an elusive and likely unobtainable goal. Sort of like what happens in Portal when the heroine is coaxed through her rather pointless journey with the promise of cake. Read about Franz Kafka’s search for cake.. LITERATURE: Franz Kafka. A video on Kafka himself to pair with the above video. In the quote above Keynes is referring to, “The immense accumulations of fixed capital” built up by the “new rich” during the half century before “the war” (WWI in this case). Keynes compared the huge capital investments of this golden era to a “cake,” noting how “vital” it was that the cake “never be consumed;” but continue to “grow” uneaten. In words, “the promise of more cake, not the consumption of it, is the driving force of capitalism in a regulated free-market”, “the carrot on a stick isn’t meant to be eaten (hoarded)”…. As it isn’t from the benevolence of the butcher that we get our meal, it is simply the fact that meat spoils and money is more economically useful than rotten meat… er um, stale cake (thus the butcher or cake maker participates in the market trading their cake for capital in the money form which doesn’t spoil… but deprecates like crazy on a bad day, hence in many respects WWII). Musing on Keynes, we have to ask ourselves, what are consequences of taking the cake of the post-WWI German people, leaving them with little but crumbs? Some might say the answer is underlying WWII. What happens to the velocity of money when people hoard more cake than they can eat? Some might say wealth inequality in its most persistent and problematic form. Legends say, “nothing drives populist fervor like seeing their neighbors have so much cake when they don’t have any” (just as our next cake super star Marie-Antoinette). BUY NOW: John Maynard Keynes The Economic Consequences of the Peace (Amazon) . “Finally I recalled the stopgap solution of a great princess who was told that the peasants had no bread, and who responded: Qu’ils mangent de la brioche Let them eat brioche.” – Rousseau from his Confessions (Amazon) . Confessions is a somewhat fabricated autobiography published in 1782, a decade before Marie-Antoinette was executed. It was written in 1760’s when Antoinette was a little girl and not even yet a Princess… oops! At some point around 1789 (the year of the French Revolution), when being told that her French subjects had no bread, Marie-Antoinette (bride of France’s King Louis XVI) supposedly suggested “they eat cake” (er, um, brioche, so technically expensive, funny-shaped, yellow, eggy buns… a type of pastry). Although in retrospect it is clear that the sheltered, but likely wiser than to say something like that, Marie Antoinette would have been simply suggesting they give away the extra baked-goods at the castle, the sentiment can be summed up as her missing of the point that the people were starving due to poverty and the high price of bread, and not starving due to a lack of cake. The fact that we can prove she never said that aside, the sentiment was, according to tales, received poorly none-the-less by the pre-Revolution French. While this cake story is most certainly a myth, likely invented (AKA “romanticized”) by Rousseau, the results for Louis, Marie, and about 40,000 others were very real. 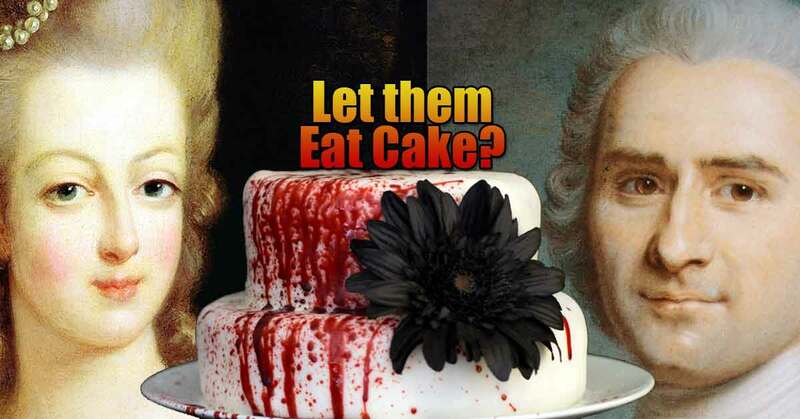 In August of 1789 The Declaration of the rights of Man and of the Citizen was signed and on 16 October 1793 Marie-Antoinette was sent to the guillotine marking the start of the Reign of Terror, proving once again, “people really dislike it when you don’t share your cake”… and sometimes even if you do. (See the birth of liberalism). As noted above, this page is meant to be humorous, using the cake meme from the video game Portal as a metaphor for the search for the meaning of life, and comparing that to Franz Kafka’s classic The Castle and other interesting historical quotes, works, and events, which deal with similar cake-ish themes. It is a paradox because it seems as though it can’t be resolved, but it can with a little high-level (but easy to grasp) logic first uncovered by Kurt Gödel, the paradox is little more than icing on the cake. This is a cake that says there is no cake. It’s an example of the liar paradox and portal meme. Source: Kathleen Franklin via flickr.com. The following video explains the liar paradox and shows how to resolve the contradiction with “logic” (the bitter enemy of those searching for cake). (because ultimately everything is either true or not true, even if we can’t prove it). How to Resolve the Liar’s Paradox. Thought experiment: Is there a recipe for every conceivable chocolate cake? Answer that question and you are well on your way to understanding Gödel. See Godel: A Life of Logic, the Mind, and Mathematics. Chapter 2. (Amazon) or read a sample on Google Books. “Liberté, égalité, pâtisserie” – a Phrase often-not-often heard during the Flour Wars. Although cake exists in the physical universe, the cake that was promised is a lie. Or more so, the promise that there would be cake was meant to leverage your self interest to motivate you toward the completion of a meaningless goal. Sorry, next time we will try asking politely, but know, it was for the greater good. TIP: *,**,***,**** Really though, there is no cake. It’s a video game reference, and we are in no way actually offering you cake. Ergo, there is cake … but you can’t have any. OR There isn’t any cake because you ate it! Brilliant answer. I agree. This is why “time travel”. I need a third choice. Perhaps ‘mu’, Japanese term meaning “reject the premise that a dualistic answer can or will be given”. Cake is real. And Cake is a con. As Eric Hoffer said, “You can’t get enough of what you don’t really want.” That is, the reason people go for tons of empty calories of cake is that it can never provide a moment of Cake, the deep fulfillment that is the root desire.